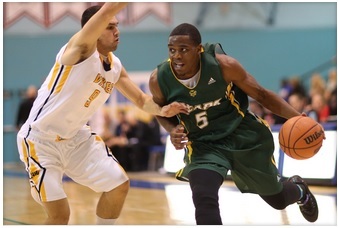 Guard Kenneth Otieno is having a stellar year playing for the University of Alberta Golden Bears. On Tuesday December 30, he led the Alberta Golden Bears won their fourth Wesmen Classic University Championship with a thrilling 64-62 victory over the Winnipeg Wesmen Tuesday night at the Duckworth Centre in Winnipeg. The Wesmen classic is an annual tournament that has been played since 1967. It has junior and senior categories. It is the longest running university tournament in Canada. It had been 12 years since the Alberta Golden Bears won this tournament. The 2014 edition brought together other college teams like the University of Winnipeg and the University of Manitoba. Otieno is a 6’3″ shooting guard. His hometown is Lethbridge Alberta. He is a student studying Science at the University. Last season he averaged 19.3 points per game while making an incredible 50.8% of his feild goal attempts. He shot 37.8% from the three point line and 80.4% from the free throw line. he averaged 5.9 rebounds per game and 2.8 assists per game. This season he is averaging 12.9 ppg, 47.1% from the field, 39.4% from the three point line. This entry was posted in Kenya Basketball News and commentary, Kenya Basketball Players and tagged Kenneth Otieno, Kenya basketball, kenya basketball players. Bookmark the permalink.